In Part I of this project, we looked at the reasons people give for not voting, and in Part II, we looked at the demographics … who isn’t voting, and why. When we put those two together, we see why some people aren’t voting, for the system is designed to make it difficult for them. In this, the final part of the project on voters not voting, we will look at some ways to effect change. There are actually two distinct groups of non-voters: those who are at least partly disenfranchised, for whom the system has made voting a difficult task, and those who are either too lazy or apathetic to stir themselves to vote. The solutions are different for each of these groups, so we need to look at them separately. But first, a disclaimer. There is no panacea, no simple, single solution that will all of a sudden solve the problem of nearly half the eligible voters failing to vote. We must find a multitude of small steps that all contribute toward bringing us closer to the goal. Registration may well be half the battle and some combination of the above ideas would likely have a significant impact on voter turnout. This group consists of people who are typically lower income or minorities, for whom just getting through the day and feeding their family is hard. State regulations have made the process of voting harder for these people by closing polling stations in their neighborhoods, shortening the hours of polling stations, and requiring a driver’s license or other state-issued identification that they may not have. The solution is simple, right? But with the repeal of Section 5 of the Voting Rights Act, there is no longer a requirement for federal oversight, and the states are largely free to do whatever they want, within certain boundaries. Section 5 needs desperately to be reinstated, but that will not likely happen soon, if ever. Meanwhile? With a republican majority in Congress, it is unlikely that legislation to help make voting easier for the disenfranchised would fly, for those it would benefit are more likely to vote democrat. One partial solution is what happened in Pennsylvania recently, when the Pennsylvania Supreme Court ruled that the state’s district map must be re-drawn in order to be more fair. The ruling was unsuccessfully challenged by republican lawmakers, and the map has been redrawn. While gerrymandered maps are not technically a barrier to voting, in the sense that they may cause polling stations to be farther from a person’s home or workplace and thus require greater travel time, the reality is that they can be a barrier. I would like to see the Supreme Courts in every state follow the lead of the Pennsylvania Supreme Court. I just wanted to hug this lady!!! She is doing something to make the world a better place, and to her, my thumbs are all up! Early voting, which allows any qualified voter to cast a ballot during a specified period prior to the actual election day. Absentee voting, whereby voters may request an absentee ballot and return it either by mail or in person, with or without an excuse. Presently, 27 states and the District of Columbia allow absentee voting without needing an excuse, 20 others require an excuse. All-mail voting, where a ballot is automatically mailed to every eligible voter (no request or application is necessary). Three states, Oregon, Washington and Colorado currently use all-mail voting. Funny story about this … I periodically make comments to my girls about projects I am working on, usually unsolicited and out of the blue. As I was working on this one, I asked the girls if they were aware that 3 states actually had all-mail voting. Daughter Chris’ jaw dropped to the ground, thinking I meant “all-male” voting! Those who are simply either too lazy, don’t care, don’t like the candidates, or believe that it is a lost cause, may be the most challenging to get to the polls. To do so will require a plethora of different things, starting with voter education, and involving large amounts of motivating and inspiring techniques. Unfortunately, these constitute the largest group, some 65% of all the non-voters. This translates into roughly 58.2 million people! While I personally believed … still believe … that Hillary Clinton would have been a good president, I admit that she came with some baggage, and was not a particularly ‘lovable’ candidate, did not run an inspired campaign. Thus, in 2016, it is understandable that many did not like either candidate. But how to convince these people that it is better to vote for the lesser of two evils than to simply shrug their shoulders and stay at home watching television? I think the starting point must be in education. According to Donald Green, a political scientist at Columbia University in New York City, it is up to parents and teachers to stress just how important it is. Common sense, yes? I don’t know the answers, but somehow we must find ways to convince these 58.2 million people that their vote counts, that they make a difference, but not sitting home on their patooties. Talk to friends who say they don’t care. Join a volunteer group that is going door-to-door talking to people. Sport a t-shirt with your favourite candidate (I still wear my Obama t-shirt!!! ), put a bumper sticker on your car. Help people to better understand the issues, the candidates. To many African-American voters in Alabama, Cecil said, “Donald Trump is the living embodiment of the idea that voting doesn’t matter.” Trump is profoundly unfit to be a president — a congenital liar and racist who lost the popular vote by 2.9 million votes. And yet president he is. This is, I think, one of the biggest hurdles, and while I disagree with the thought process, I understand it. Make sure they are registered. If they aren’t offer to help with filling out forms, taking them to register if they cannot do so online. Help them understand the issues and what each candidate stands for. Keep talking about how very important it is that everyone get out and vote, without necessarily pushing a specific candidate. Volunteer to drive people to the polling stations on November 6th. It is up to We The People, for we cannot rely on the government to work toward increasing voter turnout. We need some new blood … let’s make it happen, folks! And thus concludes this project on Voters Not Voting. I hope you have found it useful. Thanks for reading!!! This entry was tagged 2016 elections, absentee ballots, all-mail voting, automatic voter registration, disenfranchisement, gerrymandering, voter apathy, voter education. Bookmark the permalink. I think that f the people do not appreciate the vote they have been given the elite will continue to abuse it! People died to win that vote! Many thanks for the re-blog, Opher! And yes, you are so right … many people have died to give us the freedoms that we now take for granted. We should be ashamed. Great as usual. Very thought provoking!! An outstanding series, Jill, and excellent political science primer. Thank you so much, Tina, both for the re-tweets and for your kind words! Any suggestions for other posts or series are always welcome! I’ve had that one in the back of my mind for a while now, but just hadn’t done it yet. It just moved up on the priority list!!! Thanks for the suggestion! Thank you so very much!!! Yes, John is special, isn’t he? I must thank him for introducing us. I had thought it was David Prosser who sent you my way, but it was John, eh? At any rate, I’m happy you are joining the family! This post and the replies are like a breath of fresh air. It is so good to read of positive and constructive action being carried out. God Speed to you all, each and every one. Thank you, Roger!!! Fingers crossed for November. Yeh. No time for complacency. Strive, strive, strive. Jill Dennison has gifted us with the third and final part of her series “On Voters Not Voting.” She offers practical and well-considered solutions to increase voter turnout across the United States. Please share. Thank you, dear friend! Now let’s hope we can motivate people between now and November! The things you can do to make sure the voters get to the polls and vote, including yourself. Thank you so much, Suzanne!!! This is an excellent three-part series which I highly recommend reading. I would also like to add that teaching civics in public schools is imperative for increasing voter participation and turnout even though it is a long-term solution. Currently in America, voter turnout rarely exceeds 60% in presidential elections, 40% in midterm elections, and 20% in off-year state and local elections. Democracy cannot survive, much less function, in this kind of environment. Many, many thanks for sharing my work!!! And you are so right … perhaps the biggest mistake we have made in the field of education is to stop teaching civics. So very important! Thanks again! Our town’s public library has begun online voter registration. Only half the state is set up so far, and thank goodness we were a “test” city! So now, we “friends of the library” are mobilizing with the resistance here and getting people registered to vote. The library also has a sign up sheet for those needing assistance on voting days..both with transportation and translation/blind or hearing impaired assistance. We also have a mobile library unit that had a laptop computer donated just for registration…and I kind of hope my old puter doesn’t die any time soon as my backup is now mobile! LOL So we are able to reach out to smaller towns throughout our library’s district. can’t seem to help myself..raised during the civil rights movement and spent many a year marching for racial equality..now I am old and tired, but still get pissed off at injustice. Ahhhh … then you and I must be of nearly the same age! Yep, we still get pissed off about it and it’s all the more annoying since we thought we already fought and beat this battle 50 years ago! Keep up the good work, m’lady! Well done on these three posts Jill. Best wishes to all of you fighting for this right. Simply time for some Tough Love. ‘If you are too lazy or don’t care’, then you are a traitor to your nation. No two ways about it. When ‘they’ come down to upset your world, don’t come whinging to me. Well done for the effort Jill. Yes such work can be a drain when you are trying to get a message across. You have worked for your beliefs and now you can take a ‘Rest & Refit’. I suggest a non-political radio station that broadcasts programmes about nature, gardening, cookery, fine arts, etc. I suppose training the Significant Seven, to do tricks is a non-starter? And if it would ever stop bloomin’ snowin’ so that the bees and butterflies would come out of hiding, I WOULD talk to them, for I enjoy those critters. But they don’t like getting snow on their little wings, and who can blame them. More of the white stuff coming down as I speak! And as to the Significant Seven … they do tricks, alright … just not, perhaps, the ones I would like. I thought I was going to have to change it to the Significant Six a couple of nights ago, as Orange seemed to have a stroke or something, and we didn’t think he would make it through the night. But, by the next morning he had re-bounded and was back to his “normal” self, being ornery. At 18, it is only a matter of time, but … I was glad he rebounded, for I wasn’t ready to say ‘goodbye’ just yet. Argh! Poor Alt-Right the land is a’wash with Snowflakes! Aww, poor old Orange, glad he made it through for you. Since it ‘s snowing, I suggest Plan B…..cartoon shows! Re-runs of Warner Bros in particular. The bankers don’t want people voting. Heavens NO. They count on the apathy to force their candidates in. Who are their candidates? All of them. That is why they are so closely monitored by party central of whichever party. In Canada a Federal election; the last one, voter turnout was 57.1%. One imagines that the promise of legalized cannabis accounted for the Liberal party’s win? It certainly helped? That and the unpopularity of Stephen Harper and his and Conservative Party, methods. While I do not believe in democracy, I am still willing to help. And the first problem I see is with the assumption everyone has access to Computers, the internet, and the knowledge of how to use them. Especially when it comes to the disenfranchised, there are probably millions of people out there who are afraid of technology, or who cannot afford such devices. As you said about families who are barely able to feed their families–these people probably do not have the “luxury” of a computer, and computers “are a luxury” to them, not a necessity like they are to others. Maybe even televisions are a luxury, especially with the cost of cable and satellite. There are also a huge number of non-church-goers out there, and families without children at home, how are you going to reach them? Then there are other groups who are not white, African-American, Latino, or Asian, in particular Aboriginal people, Muslims (many of whom are probably scared to vote due to the way they are treated), and what about the millions of homeless people (are homeless people even allowed to vote, given that they have no permanent addresses?)? Big questions: Are there polling stations on Reserves? In homeless shelters? In hospitals, particularly longterm facilities? Seniors’ housing? Anywhere that whole groups of people may have mobility issues? These are just some of the issues I thought about as I read your above post, and parts I and II. And what about Puerto Rico? Do the people there get to vote? And where did you get the information that Canadians vote in the 90 percentile. I would dispute that all the way to the polls. As voters we are often more apathetic than Americans, for which there are many reasons, with one of the biggest being that voting for a candidate in your region translates as a vote for two people, the candidate, and the leader of his or her party. Even if you like a particular candidate, if you don’t like the leader of that party, you don’t vote. The results are rigged, and a conscientious voter will not vote for a leader they don’t like, nor will they vote for a leader they like if the candidate for that party is not acceptable. I haven’t paid attention to the numbers of actual voters in elections lately, but when I did they were often in the 30-50% ranges. But they count things like that differently now, so probably it looks higher now, but that is because a huge block of non-voters are no longer counted. The US apparently hasn’t caught on to that trick yet. I have to stop writing now, I have forgotten a number of other things I wanted to say. If I remember them I’ll get back to you. But I think this should give you some things to think about. Be well, Jill. Thanks to you and all our blogging friends who are doing posts which help educate voters. But more needs to be done especially to counter the outlets with a high rate of falsehoods like FOX TV. It is frustrating to read a 2017 Dec. poll where 51% of republicans still believe President Obama was born in Kenya. I love the idea of automatic voter registration. Thanks Gronda! Yes, much, much more needs to be done, and we must all jump in and do whatever our circumstances allow us to do. I’d like to see at least 80% turnout in November. Pipe dream? Maybe. 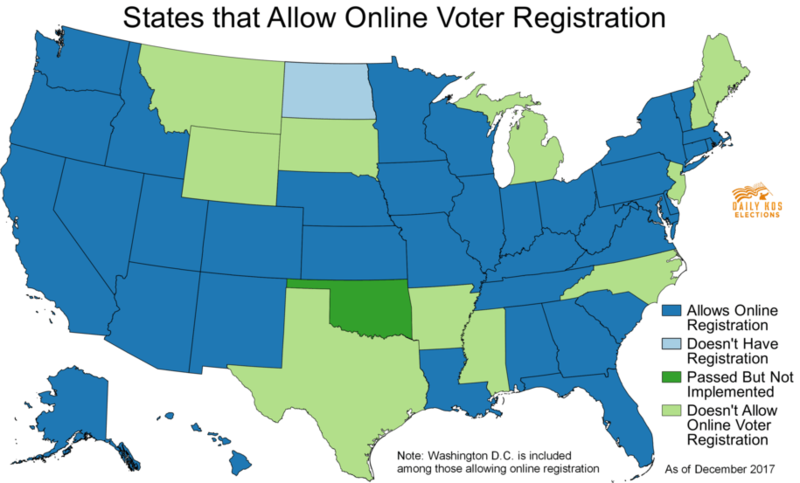 I think the automatic registration is a no-brainer, and I don’t know why every state isn’t on board with it. Oh wait … yes I do … it might result in more African-American and Latino votes, in other words, more votes for democratic candidates! Hugs!!! You are right about that! I like to thing he will galvanize many to come out of their apathetic stupor and get themselves to the polls this November, but … I’m not holding my breath. We need to keep doing all that we can to educate and enlighten, methinks. This concludes a three-part,very educational and interesting post!! This really has been a brilliant expose, Jill, and I sincerely hope that it starts some of those ‘can’t be bothered’ people thinking. One thing that got me thinking was the choice of day. It’s Tuesday isn’t it? I wonder what would happen if election day were changed to a Saturday? I know a lot of people work weekends as well as weekdays but it might help some. Thank you, dear Andrea!!! I actually intended to mention that, but after an almost straight 18 hours working on this series, my brain was fried. But yes, in Europe, most elections are held on Sunday when people do not work and have no excuse. Why Tuesday? Good question … I shall delve into it. -hugs- No delving until you’ve had some sleep! You will be pleased to know that after I finished Part III, at almost 3:00 a.m., I answered a few email, then went to bed … tried to read, but couldn’t keep my eyes open, so I gave up and went to sleep, where I slept, motionless, until nearly … wait for it … 1:00 p.m. this afternoon!!! I was simply drained! Indeed so! And I went to bed ‘early’ last night, but after 4 hours, I was awake and ready to rise! I read for two hours, then dropped back to sleep at around 6:00 a.m. for two more hours. I do wish the body would just sit down and shut up, for there is work to be done! Hah! Me too but we ignore it at our peril. I wanted to clear a spot for a new veggie patch. Involved using a pickaxe. I knew I had to be careful coz my lower back is not great. Sadly I wasn’t careful enough. Now I’m paying for it. I honestly didn’t realise that it would be these little things that I would hate most about ageing. I’m with you on that one … there are some things that I actually like about aging, such as the fact that now when I act nuts, like … oh … singing and dancing in the rain in the grocery parking lot … people just look at me and smile and say, “awwww, look, an odd little ol’ lady”. But what I hate is that my body cannot keep up with my mind. It gets slower and more tired and I don’t know how to energize it. Sigh. I am so sorry about your back, though! I hope you are taking it easy for a few days now? And yes, I’ve been taking it easy even though I’d love to get out there again. Ah well.